The following ideas and small projects are for people who do not own many things Tolkienien (like me), but would like to make their world more Middle-earth related. I have a tiny bedroom and limited space, but for those with big rooms, you have plenty ideas to utilize! Cardboard and posterboard are cheap, easy to cut out, and produce satisfying results. Note: These suggestions may take a lot of patience and time, and some require a certain degree of artistic ability, but are inexpensive and useful for those on a tight budget. This is really cute, and can be personalized by adding a name. Using a picture reference, (I recommend the Official Guide to the movie by Brian Sibley), scale and cut out the shape of the Prancing Pony sign. Colour it correctly, and then mount it on something harder if you wish. To hang it on your wall, get an iron or wood rod and nail it to the wall. Hang your Prancing Pony sign on it, and watch it sway! If you can’t get a rod, securely tape a long stick to the top of a shelf, and do the same. The results are very satisfying. This makes an excellent gift idea for a LOTR fanatic friend. I found that calligraphy has an extremely Elvish feel to it, especially fonts like Gothic Cursive and Uncial. Elvish is also very beautiful when written with a calligraphy roundhand pen or quill. Label your schoolbooks, files, drawers and work with your name or titles in calligraphy! You’ll be surprised how this can help. Borrow books from the library about calligraphy and you will get more ideas about this. You can also draw out your own middle earth map if you know calligraphy. It looks authentic and is fun to do. Make a sign with your name on it, with an Elvish border, and hang it up. All you need is cardboard, pen or quill, and ink. Have a whole load of Math or Science books with ugly designs on the top? Or even exercise books? There are many wonderful designs you could use for a front cover. One idea is the Moria front gate. Print or draw it out, then in place of the Elvish words, put the title of the book or your name, so you can identify it. You can also bind your books in an old-fashioned way using paper or cloth (note: this only works on hardcover books.) For cloth, stretch a piece of parchment-coloured fabric and stretch it tightly over the cover, securing with staples or glue. Use fabric paint (gold is nice) to print the title of the book. For paper, bind the book in parchment-style paper (brownish) and use black calligraphy ink or marker to write the title of the book. Use the font Uncial for this, or any one you find attractive. For ambitious artists, you can write the book Bilbo wrote out on parchment paper. Take maps and words from anywhere, and them bind it together and you will have your own “There and Back Again, A Hobbit’s Tale by Bilbo Baggins”. For this, you need plenty of stiff paper which is not too flimsy but hard enough to stand on its own. Look at the Lothlórien boat for reference. With the cardboard or paper, painted a light grey-blue colour, cut out the shape of the swan boat and tape the sides together with glue or masking tape. It can be any shape you want, e.g. box-like or a proper boat (with a stand). The swan should have its head sticking out straight. The complicated roof-like thing on top should be two parts combined into one overhead design. This can be as big as you want it. Use your creativity in the design. As long as it looks elvish, change anything you want. This is really good, especially if you have a very plain bookshelf. Look for picture references from Elrond’s chamber in the movie, or from pictures. The shelves have very intricate designs on the borders. Using cardboard, cut out interesting borders for the sides of the shelf, and then paint it the same colour. This should be the length of the shelf, but not too wide so you can still put in books. The designs are interweaving and quite difficult to follow, so you can make up your own design. Using blu-tack or glue if you want, stick it to the sides of the shelf. Alternatively, get artificial drooping leaves and hang them by the sides of your cupboards or shelves. This can be done on any kind of paper you like. You can choose absolutely any picture you like, draw or print it out. I like the round logos used by the elves (Gil-Galad). Put them on your books, desk, files, personal items, anything, to add your own signature to your work or area. You will need a large piece of cardboard or posterboard for this. 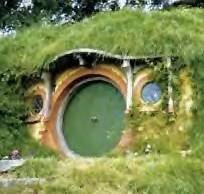 Draw and colour the Bag End or any Hobbiton door. Cut it out, and paste it on your wall. You can either draw on the doorknob, or make one out of paper or plasticine. For those lucky ones with gardens and lots of space on your wall outside, stick the circular door there, covering it with a plastic sheet first (it can also be lacquered for waterproofing). Add pictures of vegetation, or even better, put your own pots of flowers and plants around the door. Remember that these Hobbiton doors also have structures around them like pillars, and you could add them also. Hand-drawn pictures are the most beautiful, but printing out pictures is equally pleasant, especially if you grayscale them. Frame them anyway you want, or using my frame method. Mount on a parchment-style paper, and hang it up with blu-tack or a nail. Some very beautiful maps are available at bookstores, or you can draw some yourself. If you have purchased swords and other items, even dresses, display them on your wall so that everyone can admire them. You can draw or print out life-size swords and mount out on cardboard, then hang it on your wall. It will not be as nice as a real one of course, but properly drawn can be very effective. In the book Art of the Fellowship of the Ring by Gary Russell, there are some sketches of statues of elves. Another example is the shot of the stone statues behind the dwarves in the Council of Elrond scene in the movie. Using our trusty cardboard again, copy out these elves and paint them any colour you think looks nice. Due to the lack of space in my room, I scaled one down to the height of my knee, and put it on my desk. It would look lovely life-sized on your wall. The lovely Lothlórien houses in the trees are amazing. You can create your own headboard in your bedroom with (of course) cardboard or paint it on your wall. The long streams hanging down can be created with anything you like: cloth, string with glitter, anything. Display all your Tolkien books and CDs the way they do it at bookstores, making sure that you can see the front cover designs. Put up a sign in calligraphy saying “Elrond’s Library” or write a title in Elvish. Impress your friends! In the same corner, or another one, put all your Tolkien collectibles: T-shirts, jewellery, toys and other merchandise. It is nice to scatter them all over your house, but I prefer displaying them in one special shelf or corner for everyone to see. Skim through the making-of-the-movie books, or look out for ideas when you next watch the movies. You will find a dozens of good ideas waiting for you to pick out and use to make your world more Tolkienien. With a little imagination and paper, you can do it on a budget too. ^ Ugh. Pardon my terrible spelling and overuse of exclamation points.